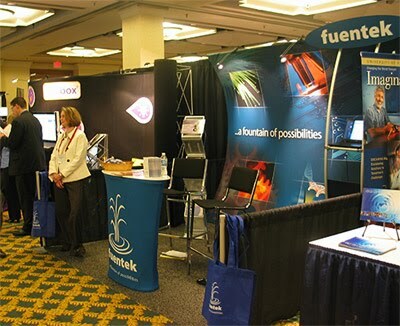 Laura Schoppe (Fuentek president and founder) and I staffed an exhibitor booth at the 2010 annual meeting of AUTM (Association of University Technology Managers) in New Orleans from March 18th to 20th. The meeting included 1,650 attendees and more than 70 exhibitors. We engaged with hundreds of technology transfer professionals across the globe over three very full days. The exhibit floor remained quite busy throughout the conference and provided both of us with new insights into the current challenges and opportunities for university tech transfer offices across several continents. The feedback on the plenary sessions, presentations, and panel sessions overall was positive. We have already initiated our planning for participation in the 2011 annual meeting. This entry was posted on Friday, March 26th, 2010 at 13:48 and is filed under IP Marketing. You can follow any responses to this entry through the RSS 2.0 feed. Both comments and pings are currently closed.